The Botticelli is a ship of spacious rooms and warm colours giving you an unforgettable cruise along the Rhine and its tributaries. All the cabins of the Botticelli are homely and come with modern amenities allowing you to feel at home while still being on a fantastic adventure. These include a bathroom with shower and toilet, hairdryer, adjustable air conditioning, a TV, a safe and central heating. 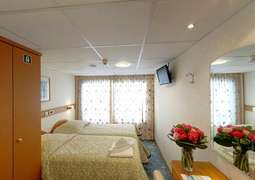 The windows allow you to get a wonderful view of the Rhine and fill your cabins with natural light. The large and welcoming restaurant provides you with the highest quality dishes from European cuisine as well as local specialties coupled with outstanding service from the polite and attentive staff. To complement these wonderful meals there is a selection of fine wines. There are a number of activities awaiting you on board the Botticelli so it does not matter what kind of passenger you are – there will always be something for you! During the daytime you can go onto the Sun Deck to relax with the warm sun kissing your skin and a gentle breeze brushing your face while the beautiful scenes on the river pass you by. In the evenings you can go to the lounge with its panoramic windows and have a nice drink while socialising with other passengers and enjoying live music. Or for a more wild night, the night club gives you the perfect place to dance the night away. There is a welcoming and informal atmosphere aboard the ship and therefore it is advised that you wear casual attire for the most part, except for the Gala dinner where more formal clothing is recommended.